Vernissage has everything from junk to jewels . . . 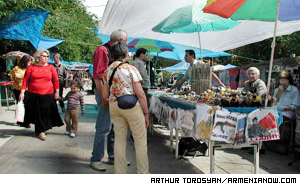 It is impossible to think that a tourist would visit Armenia and not find Yerevan's "vernissage" open market, shopping mall, bazaar and all-around cultural curiosity center. Stretched out over four blocks in the center of the city, visitors can buy just about anything at vernissage, from paintings to puppies. Each Saturday and Sunday, beginning at about 10 a.m. and continuing till early evening, vernissage is home to hundreds of artists, craftsmen, jewelers, stone cutters, seamstresses, potters . . . It is also where men and women who can't find jobs have turned to sell everyday goods ranging from nuts and bolts to used clothing. "Vernissage is my second home as I've been coming here for 11 years every Saturday and Sunday," says 42-year old carpenter Gagik Simonyan, sitting in front of his table and carefully working on one of his unfinished plates. "When all factories were closed in Armenia this had become my working place and the only way of maintaining my family." Yerevan has no shortage of gift shops, but if you ask any resident where you can purchase Armenian souvenirs, the first answer will be "vernissage". Two days are hardly enough for taking in everything there. This is a place where beauty was created as means of survival. Ten year ago most of the craftsmen sitting here had different professions. They were doctors, architects and policemen. Mixing with old and new Armenian styles, their boundless imagination is constantly creating something. Thousands of souvenirs of different styles and types carefully made of silver, marble, wood, ceramics, cloths, different stones, threads and even fruit seeds. The name "vernissage" comes from the end of '80, when a selling exhibition was organized in the park next to Opera House, in the area surrounding the monument of Saryan, where mainly Armenian painters were presenting their works. However, in the 90s, during period of crisis, day in and day out different craftsmen and numerous traders began joining painters turning the central part of the city into market. . . . . and it is a treaure and a trap for foreigners. That's why in 1993 local authorities ordered to move the market into another central area, which didn't mar the appearance of the city so much. Many painters still choose to sell their work at what is now called "painter's vernissage" at the original location. When you buy souvenirs, some of the craftsmen or salesmen will tell you the meaning of their products. The "Nuri-Nuri" doll, for example, is a colorful rag doll meant to be hung in the home to bring good luck. "People here are not pursuing only material gains but they enjoy spiritual pleasures as well," says 48 year old craftsman Hayk Andreasyan. "If I didn't work here I would never have met painter Jansem. Sometimes we paint together. There are people next to us who have become our close friends." Master Hayk has been in Vernissage for 10 years. Everything started from his first handmade work. He made a wooden miniature violin the size of a forefinger. After that he decided to improve his skills. Today one can find approximately 20 musical instruments on his table including miniatures of other musical instruments including the duduk, guitar. Dhol, electronic guitar, kiamancha. Each of them costs 4000-6000 drams (about $7-10). Andranik Davtyan, 34, makes miniatures of well-known Armenian churches that sell from $20 to $400. 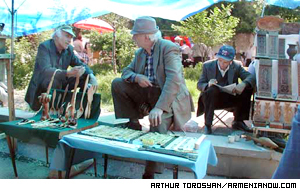 Davtyan says the vernissage income is seasonal, as souvenir sales rely heavily on tourists. "Our works aren't valued so much as handwork in Yerevan," says master Gagik. "There are resellers who buy works here and sell them abroad for double the price as a work of art. But here we can't sell them for high prices or else we would lose our clients."